Over the past decade, Los Angeles’ art scene has exploded. New museums have opened, international galleries have set up shop, and planeloads of freshly minted MFAs pack their brushes and canvases to move here each year. Despite that energy, surviving in L.A. is a struggle for many working artists. Some work multiple jobs to make ends meet while also pursuing their craft. For artist Tatiana Vahan, that struggle became tangible when she began having health issues that put her out of commission for about a year. “I wasn’t able to work,” she explains. That crisis was the genesis of a grassroots grant program she’s dubbed Bar-fund. 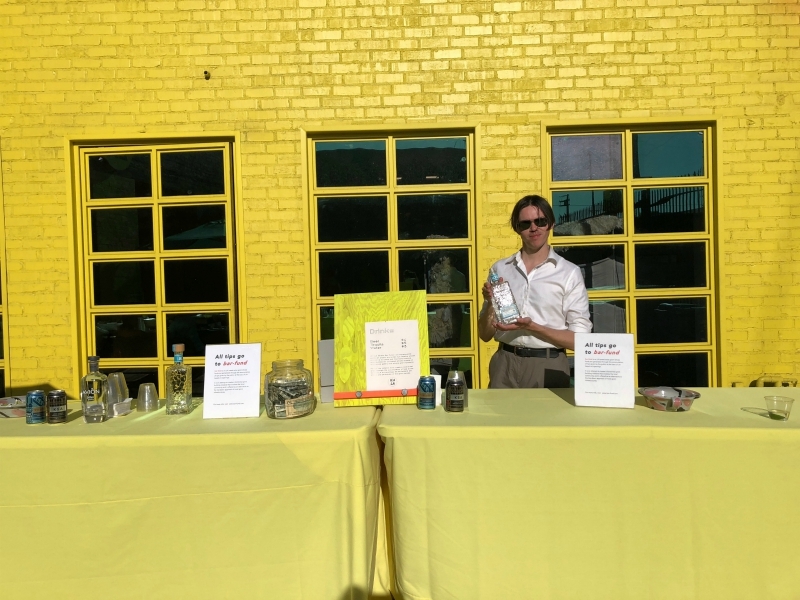 Pooling the small tips given to volunteer bartenders at art events, performances, and museum openings at places like the Institute of Contemporary Art Los Angeles and the soon-to-close 356 Mission gallery, Vahan leads an artist-run initiative that redistributes the funds as art grants. Disillusioned with the lack of funding opportunities outside of traditional art infrastructures, such as commercial galleries and private grantors, Vahan has created a direct-to-artist, community-based alternative. For Sarah Williams, managing director of the non-profit Women’s Center for Creative Work and a member of Bar-fund’s advisory board, the beauty of the initiative is its simplicity. “They’re not asking for anything out of the ordinary. You get a drink, you tip the bartender,” she says. “In a way the project was conceived out of necessity but driven by anger,” says Vahan, who moved to L.A. seven years ago from Miami. She watched as the art scene exploded, but also noticed that many artists were left out of the financial windfall that comes with a thriving art market. Vahan’s goal isn’t just financial support for her fellow artists—she also wants to empower artists by bringing them into the decision-making process while shining a light on the need for greater funding. 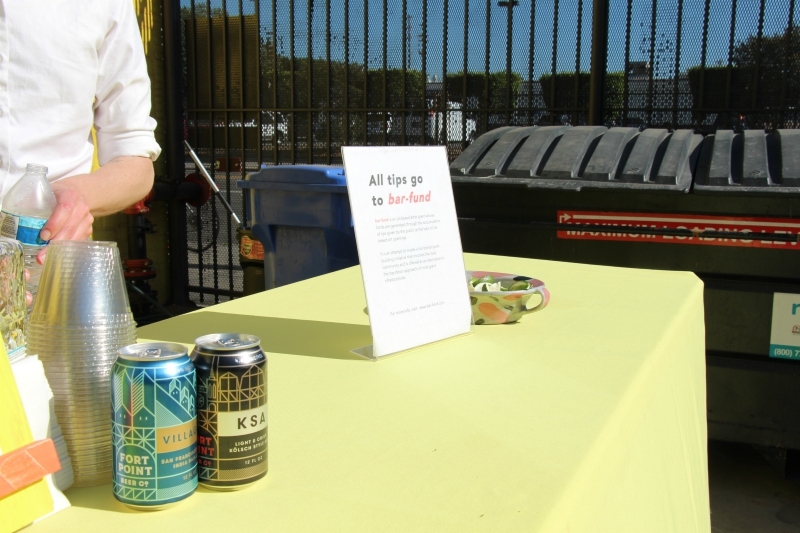 Bar-fund collected tips at a recent opening at ICA LA. While most grant-making panels are made up of critics, curators, and foundation insiders, Vahan sought to turn that model on its head. Bar-fund’s panel consists entirely of other artists. “It puts artists in a position of power to decide what’s important to fund in their own community,” explains Vahan. An open call in February resulted in 183 applications for grants. After raising $5,753.94 from bartending art events, an anonymous donor matched the funds. Bar-fund distributed ten grants of $1,150.78 each to artists living in Los Angeles in March. Recipients represent a diverse array of artistic practice and aesthetic style, from performance artist Yoshie Sakai to photographer Mark McKnight to painter Brandon Drew Holmes. Vahan, who professes an interest in “money and value formation” as the subject for her work, would like to take this project further by creating an artists’ census. Her goal is to collect financial data on artists in Los Angeles to assess need versus available resources. Ultimately, she’d like to establish a non-profit whose sole mission is to gift unrestricted grants to artists in the city. In the meantime, just remember to tip your bartender.